This month’s Recipe Redux theme is all about showers, or brunch parties. It is that time of year for baby showers, bridal showers, graduation parties, etc. My first thought was that my Breakfast Pizza with Cauliflower Crust would have been perfect! Instead, I came up with a dish that would be great for a buffet style brunch, Broccoli & Sausage Egg “Muffins”. I use the word “muffin” loosely – there is no flour or grain involved. Calling it a mini-quiche just didn’t seem quite right either. These also make a splendid grab and go breakfast during the week that could be made on the weekend and then stored in the refrigerator or freezer. It is really simple, which these days, is what my life is all about. I looked at doing more elaborate recipes, but I honestly just don’t have the time or energy this month! And I needed something quick and easy for my family this week for breakfast too. I’ve actually been toying with this idea for months now and just getting around to doing it. The simplicity of this dish also lends it to great versatility. It would be easy to make some without sausage or use bacon instead. Not in the mood for broccoli, no problem! Use spinach, zucchini or asparagus. The options really are endless. You could even put out a variety of toppings and let people construct their own then bake off all together for a more interactive brunch. 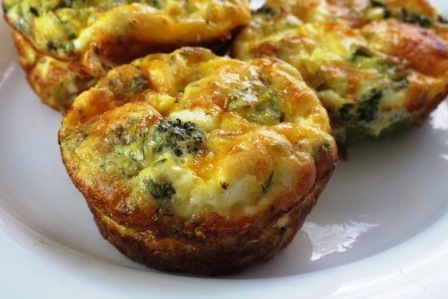 Broccoli & Sausage Egg "Muffins"
These Broccoli & Sausage Egg "Muffins" are simple, yet versatile. Perfect for a brunch buffet or make ahead grab and go breakfast during the week. Preheat oven to 375 degrees F. Coat muffin pan with cooking spray. Brown sausage in a pan and crumble. Cook until done and no longer pink inside. Drain sausage leaving a small amount of grease in pan. Set sausage aside. In pan, cook onion and pepper until soft, about 3 minutes. Add broccoli and cook for an additional 3 minutes. Remove from heat and combine with sausage. Beat eggs and milk. Add herbs and spices. Mix well. 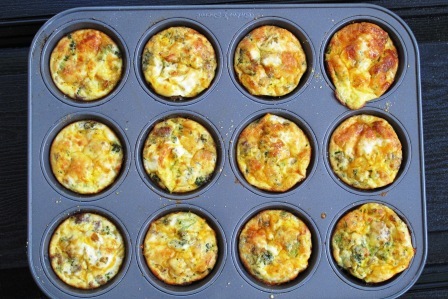 Divide vegetable and sausage mixture evenly among 12 muffin cups. Top with shredded cheddar cheese, divided evenly among each. 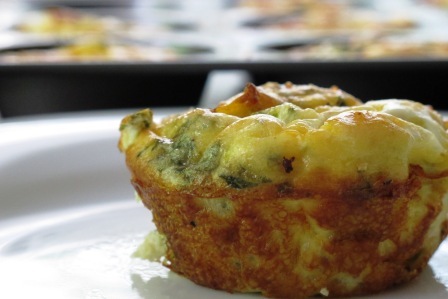 Pour egg mixture into each muffin cup, about ¾ full. Top each with grated parmesan, divided evenly among each. Bake for about 20 minutes or until eggs are set and golden brown on top.